This afternoon, a fire caused a secondary building at St. Jacobs Farmers’ Market to be evacuated. Dale Martin, deputy fire chief of Woolwich Fire explained what happened when the fire department arrived on scene. “We got a call around 1:35 [p.m.], alarm ringing, possible fire on the roof,” he said. By 3:30 p.m., the fire seemed to be out and the scene had calmed. With several customers coming from all over K-W to visit the Thursday market, the main priority of the police and fire departments appeared to be the evacuation and safety of tourists and shoppers. “Nobody was hurt. The police, they helped us out. They did a great job helping evacuate the building. We evacuated the whole area. We got the people out of the smoke. There’s a lot of people here, but no injuries,” Martin said. 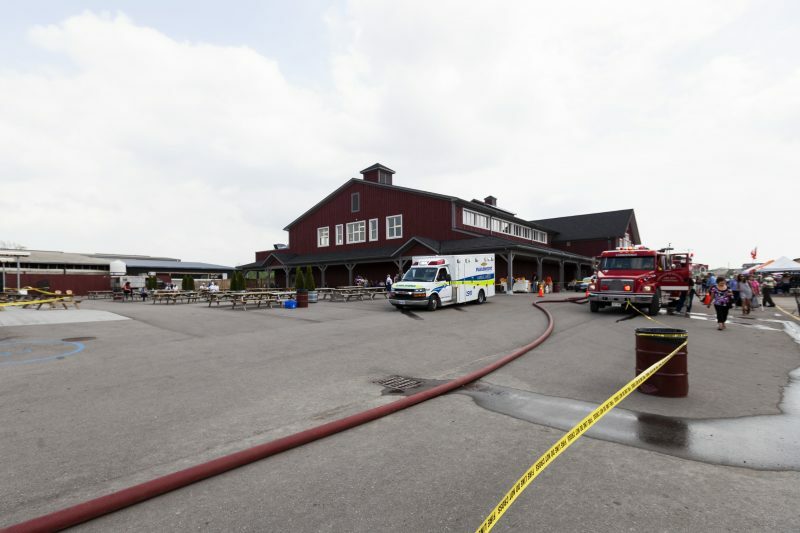 In 2013, St. Jacobs Farmers’ Market suffered a fire that caused major damage to the primary building. The newly renovated building re-opened last year, in June 2015.